Moleskin 8×11 watercolor journal, Pentalic HB woodless pencil, De Artramentis Document and Super5 ink, and Daniel Smith, Holbien and QoR watercolors. This entry was posted in art journal, drawing, gods and goddesses, journal, pen & ink, sketchbook, watercolor and tagged art journal, Fake Journal, International Fake Journal Month, Kali, Kalima, merry-go-round, Roma Gypsy, Saint Sara, Super5 ink. Bookmark the permalink. Nice work on the carrousel! Does it belong to the gypsies? Interesting statue of Kalie. Sounds like she has a lot of responsibility. 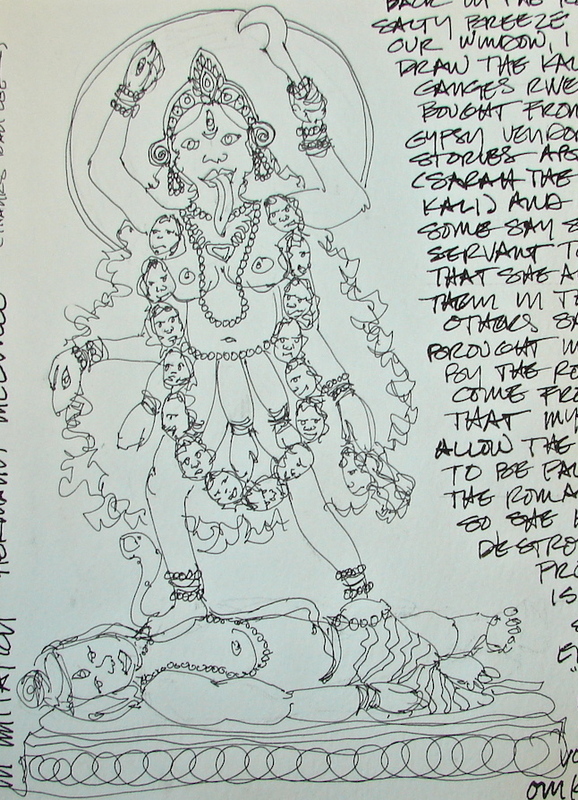 Kali is a HUGE goddess in India. I know a lot about her and will write more as Mitchell is asking me to do a nice watercolor of her. Better to fail in originality than to succeed in imitation. Exactly. Thanks for the boost today. I needed it. You are welcome. Sorry I’ve not read your blog lately — kidney stones are limiting me! Oh, yuck! I hope the pain isn’t too bad. My niece had those. Not fun. Hope you feel better soon! Thanks Jilanne; Monday is the day!